Recently unveiled at an Apple media event, Steve Jobs proudly unveiled the second-generation iPad, tagged as the iPad 2. Today, Apple’s new tablet would hit store shelves at 5 p.m local time, all over the country. With the tablet already able to generate a lot of buzz, a few of the eager customers were seen lining up outside some of Apple stores, almost a day in advance. Unlike other Apple products, the company didn’t offer the product for an extended pre-order period and neither was it allowing customers to reserve the tablet weeks before of the sale. This is the very first time, the company opened doors for pre-order at the launch day of the device. iPad 2 Pre-order starts at 1 a.m PT with devices expected to arrive to customers sometime next week. This obviously means that potential customers or gadget craving fans would be seen lining up outside Apple stores on the launch day. 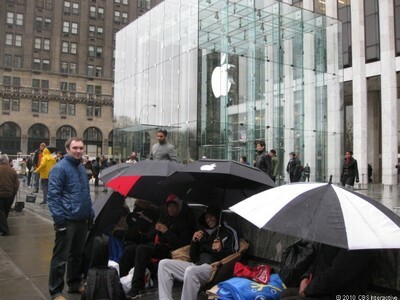 Long lines are already being expected at a number of stores with customers predicting shortage of certain models of the iPad 2. But on the other hand, employees and workers at retail outlets say they’re ready. Apart from Apple Stores, the iPad 2 would also be available at Target, Wal-Mart, Sam’s Club, Verizon and AT&T retail locations, including online via Amazon.com. I can’t guarantee that we will have every model in stock. But we will be getting more over the weekend.